Beer #4 was today. I am trying to do one beer a day at the Beer Academy. 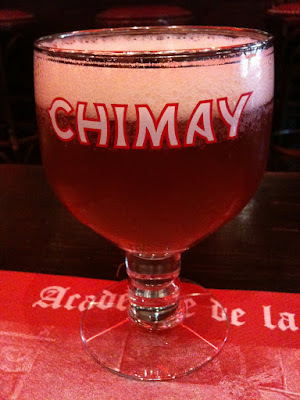 I had a Chimay Blanche. It was also 8% ABV, like the La Chouffe (the first two beers were closer to 4%). It was also 33 cl instead of the previous beers which were only 25. It was also more expensive at 6.2 Euros (about $9). I find most of the beers here to be expensive, along with everything else (by at least 50% and usually 100%). It was smooth but had a slight bitter taste. We had it with Francfort sausages (hot dogs to you and I) and fries, which worked ok I guess. This one will take a little more getting used to than the La Chouffe but it's a keeper.